An incomplete game engine I made for 7DFPS 2014 using C and a bit of Lua. 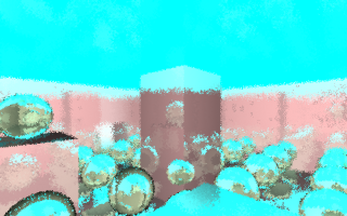 It's a realtime raytracer that happens to be pretty shiny. It comes with a pre-built Windows .exe and some source code so you can build it for platforms that aren't designed to make development nigh impossible on. GCC and Clang both work, although the latter lacks OpenMP support so you won't get much speed out of it. Add Lua bindings for key presses and camera placement/orientation. Move the player physics from C to Lua. Make it possible to win and/or die.